If you've purchased the website add-on or HubSpot CMS, you can move pages between the landing pages and website pages dashboards. Hover over the page you wish to move. Click the More dropdown menu, then select Move to Website or Move to Landing Pages. A dialog box will ask you to confirm you want to move this page. 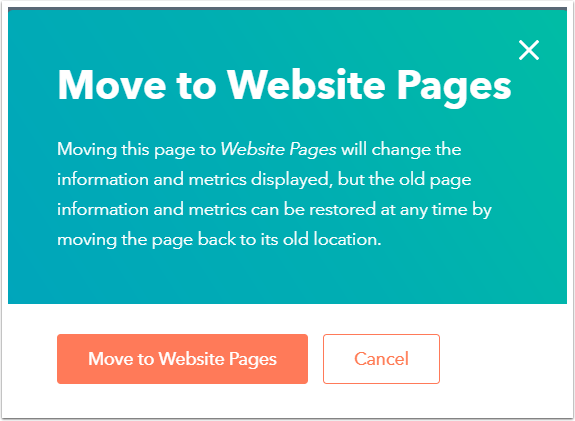 Click Move to Landing Pages or Move to Website Pages to finish moving the page. Please note: moving a page to a different dashboard resets its performance metrics. You can access these metrics again moving the page back to the original tool.